The plan marks one of Governor Charlie Baker’s most high-profile bids to address climate resiliency as he begins his second term. Governor Charlie Baker, a Republican who once campaigned against raising taxes, unveiled a proposal Friday to hike the tax on Massachusetts real estate transfers by 50 percent, and funnel the more than $1 billion it could generate in the next decade into steeling cities and towns against the effects of climate change. The plan, which Baker intends to include in his state budget proposal on Wednesday, marks one of his most high-profile bids to address climate resiliency as he begins his second term. But it’s also expected to face heavy resistance within real estate circles, where trade groups warn a tax hike could exacerbate the region’s already steep housing costs. Baker’s proposed tax increase would add nearly $1,200 in taxes to the sale of a $500,000 home, with those costs paid by the seller. Baker said the increase to the so-called deeds excise rate could generate anywhere from $130 million to $150 million annually toward a Global Warming Solutions Trust Fund, which cities and towns could then tap through grants, loans, and other avenues for local projects. That could include modernizing public buildings, fortifying sea walls, or improving drainage and flood control methods, depending on a city or town’s needs. “This is an excise tax that’s basically about property. And the proposal we’re making here is to protect property,” Baker told reporters after unveiling the contours of the plan to hundreds of local officials at the Massachusetts Municipal Association’s annual meeting. “We think in the long run, the cost benefit on this one is a good deal for Massachusetts residents,” Baker said. The tax increase, which would need legislative approval, could mean hundreds, if not thousands, more dollars borne by those unloading their homes. Under current law, a home seller in most parts of the state pays $4.56 in transfer taxes per $1,000 of a purchase price. That means for a $500,000 home sale, a seller pays a $2,280 tax bill. If Baker’s proposal passes, the transfer tax rate would jump to $6.84 per $1,000, meaning for the same $500,000 sale, the tax bill balloons to $3,420. On Cape Cod, where the excise tax is lower than the rest of the state, the increase is actually more dramatic under Baker’s proposal. The $3.42 per $1,000 of a purchase price home sellers currently pay would jump by 67 percent to $5.70. During four-plus years in office, he has signed a number of new fees and taxes into law, including an assessment to help cover the cost of the state’s Medicaid program and an estimated $800 million payroll tax, split between employers and employees, that goes into effect in July to pay for a new paid family and medical leave program. Baker also signed off on a new $2 surcharge on car rental transactions to raise up to $10 million toward training for local police. 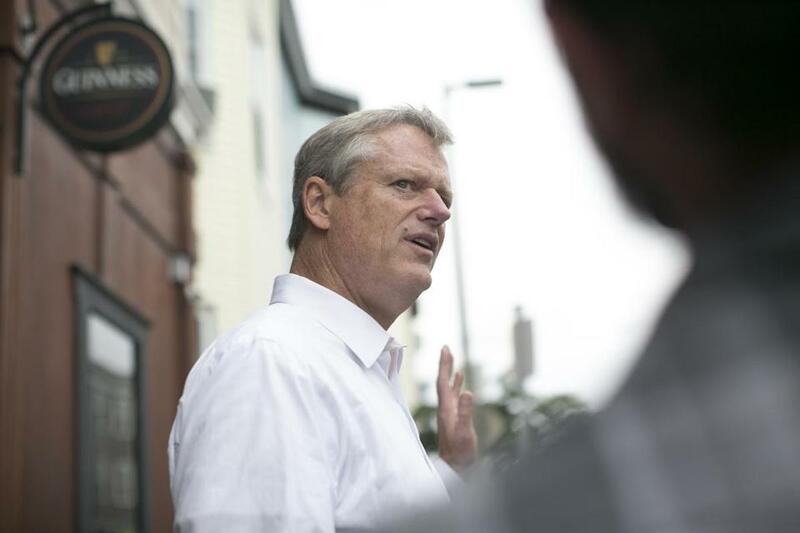 Baker defended his pursuit of the tax hike in the new climate change proposal. “There’s no program in Massachusetts that’s going to put a billion dollars on the table to put the kind of resiliency programming in place that we’re going to need to deal with the intensity and the frequency of storms,” he said. His administration, however, also noted that it has already invested $600 million in programs targeting the effects of climate change. The proposal is the second major climate-change-focused initiative Baker has touted since winning reelection. Last month, Massachusetts and eight other states announced a landmark agreement to create a system to impose regionwide limits on transportation emissions, the nation’s largest source of carbon pollution. Within hours, the plan was drawing resistance from the real estate industry. Tamara Small, chief executive of NAIOP Massachusetts, the powerful trade group for commercial real estate, questioned tying the fund to property sales. The Massachusetts Association of Realtors, which opposes the increase, said efforts to support climate resiliency shouldn’t target only those looking to sell property, said Justin Davidson, the group’s general counsel. “There’s a direct connection between what cities and towns have to do, and the proposal the governor made,” Beckwith said. Environmental groups, who have been critical of Baker before, offered cautious praise Friday for this proposal, noting they’re still waiting to see all of the details. Bradley Campbell, president of the Conservation Law Foundation, said he was encouraged by Baker’s plan, but called the money it could raise “modest” compared to the projected need.